Hello MyAtari friends! This time I want to introduce another new device. 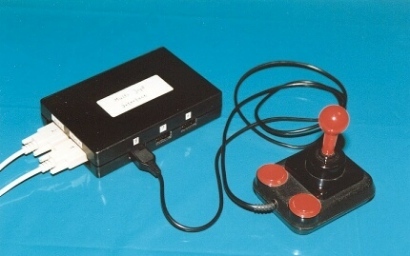 It is called the MultiJoy8 interface and with this, it is possible for eight people to play together on an Atari XL/XE with one joystick each. The MultiJoy8 interface is attached to the computer with two joystick extension cables (Sub-D cable) at the joystick ports. Eight connectors are built into the interface for the joysticks of the players. Radek Sterba (Raster) has made two programs for the MultiJoy8 interface. The interface is based on an idea of the Atari-Club Prostejov. The two programs are Cervi and Multris. Cervi is a variant of Snake or Tron for up to eight players. Multris is a simultaneous Tetris for which up to four players can take part. Both programs are freeware and are published on the ABBUC magazine diskette number 66. 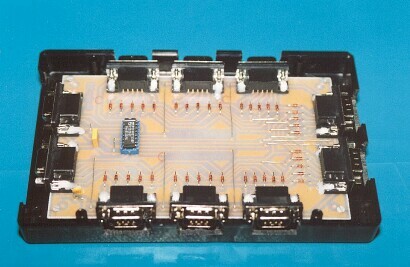 The wiring diagram of the MultiJoy8 interface was also printed in the ABBUC magazine. Andreas Magenheimer (Charly Chaplin) had already submitted a detailed description of the programs there, too. He also requested for the production of the interface (by the RAF) once again. Because of the demand of some other interested people before, I have already promised the production. So I started to rebuild such a device. Cervi is an exciting game. The more players join the game the bigger their fun. The computer will handle the non-human players, so there is a lot of traffic on the screen. It's tricky to navigate the "worm" without collision. An extra difficulty is to spot your own player on the playing area when the game starts. Starting positions are randomly chosen. Look out for the number of your worm and the direction it moves! Multris has the same basic playing rules as the classic one-player Tetris. If a player "busts" the others get extra points, that's the difference. There is no interaction between the playfields. At the web site of Radek Sterba is some additional information about the interface. Unfortunately, I can't read Czech and so don't understand any of it. However, assembler programmers can detect the input of the joysticks with the small routine shown there. The interface circuit isn't as complicated as it appears at first sight. With the joystick port 0 the status of each joystick is read (direction and fire button). By the joystick port 1 the desired joystick is selected by means of a decoder. The software apparently requests the condition of all joysticks one after the other (time multiplex). I have supplemented the design with another feature: every joystick port also receives the supply voltage provided by the computer. So joysticks with auto-fire function or similar electronic expansions will work. I have created a layout for the circuit and brought it to a standard euro circuit board. This is necessary because of so many connectors on it. Fortunately, there are project cases available in electronic stores for this circuit board size. The connection of the interface to the computer can be carried out with the usual Sub-D extension cables. I completed the first device for the ABBUC JHV 2001. The visitors could look at it and also try it out there. Regrettably, the interest of the visitors wasn't very high. But I have sold this first interface to a friend, The Gambler. Unfortunately, there are only the two mentioned programs so far which work with the MultiJoy8. I hope that even more programs appear in the future. Whether and who will do this depends upon the demand of interested people. If you love this kind of game and would like more, address your wish to Radek Sterba; perhaps he will surprise us with another nice program for the interface soon. Of course everybody is also invited to write software for it. Maybe someone is programming a game right now and can improve it for up to eight players! A MultiJoy8 interface costs 40 Euro. A connection cable costs 2 Euro (2 meters, 2 pieces required). The costs for packing and posting are not included and depend on the mode of transport, the size and the weight as well as the place of residence of the customer.